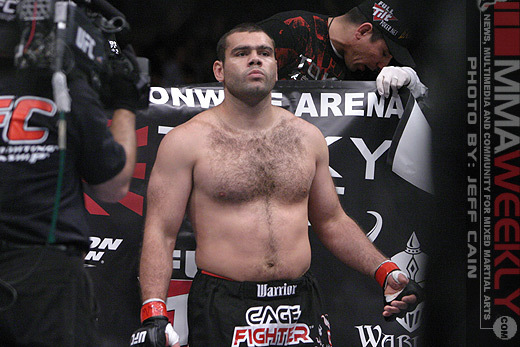 Gabriel Gonzaga is back in the UFC and will face Ednaldo Oliveira at UFC 142 in Brazil. Gonzaga’s manager and trainer, Marco Alvan, confirmed the news on Friday. According to his manager, Gonzaga signed a new four-fight deal with the UFC as well. A former UFC title contender, Gonzaga exited the UFC after a unanimous decision loss to Brendan Schaub at UFC 121 in 2010. Following the fight, Gonzaga actually contemplated retirement, but opted to come back in October after almost a year away and defeated Parker Porter in his return bout. Now Gonzaga, who trains out of Massachusetts, will have the opportunity to return home to Brazil where he’ll face Octagon newcomer Ednaldo Oliveira. Oliveira was originally scheduled to meet Rob Broughton the card, but the British born fighter was forced off the show due to injury. Over his UFC career, Gonzaga amassed a 7-5 record while competing for the promotion. When Gonzaga returns in January, it will also be his first fight at home in Brazil since 2004 in his last bout before signing to the UFC.